'Is It Just Me?' traces a young man's journey out of the dark depths of a Pentecostal church ("Everything but the snakes") through the hazards and mishaps of early gay adulthood to a place of relative peace and contentment. Songs, scenes, monologues and a frank and open use of puppets fuel the show. Get tickets at Brown Paper Tickets. 'Is It Just Me?' 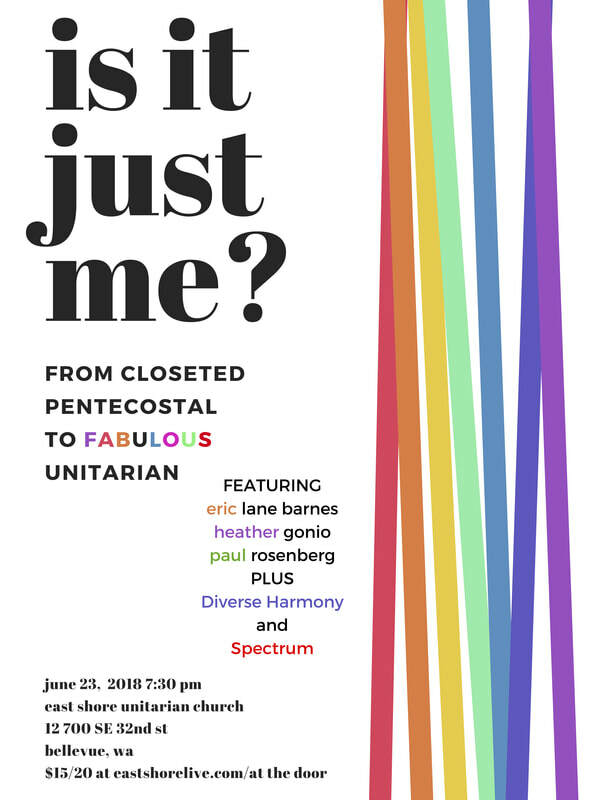 features Heather Gonio, Paul Rosenberg and a curtain warmer by Seattle's LGBT Youth Chorus 'Diverse Harmony.' June 23rd at 7:30 pm at East Shore Unitarian Church in Bellevue, Washington. I have written several shows: 'Fairy Tales,' a 21-song revue that played numerous cities in the 90s, eventually ending up Off-Broadway and in London's West End. 'The Stops,' features three lady organists from three different denominations who team up when they learn their favorite Christian songwriter and organist has been fired from his job at the Quad Cities Faith Tabernacle for being gay. 'The Holiday Stops' adds a fourth lady organist to the trio. As they try to put on a holiday show it becomes apparent that progressive, inclusive Rose is not as welcoming and accepting as she thought. 'Is It Just Me?' follows a young closeted Pentecostal kid through high school, college and professional life as he (okay, it's me) breaks past one barrier after another. I have written three kids' shows: 'The Amazing Bone,' based on the book by William Steig, 'Mike Mulligan and His Steam Shovel,' based on the book by Virginia Lee Burton, and 'Simple Jim and His Four Fabulous Friends' based on the Wandering Hero myth one finds told in virtually every storytelling culture on earth. Each show is available for license; 'Amazing Bone' and 'Mike Mulligan' require obtaining subsidiary rights from the publishers of those books. Check the Song Catalog here for choral shows such as 'We Can Do It!' 'Unsung,' 'Prom Night' and 'The Purim Superhero.' Email me at ELB@ericlanebarnes.com for more information, reviews, perusals and more.